Jaragua do Sul, March 28, 2016 – WEG S.A. (Bovespa: WEGE3 / OTC: WEGZY) announced the acquisition of Bluffton Motor Works, LLC. (“Bluffton”), an electric motor manufacturer with headquarters in Bluffton, Indiana, USA. According to Mr. Luis Alberto Tiefensee, WEG’s Motors Managing Director, Bluffton is recognized for excellence in engineering and manufacturing of fractional motors for custom applications, which is aligned with WEG’s focus for the US market. “This acquisition is strategic to expand and to provide greater flexibility to WEG’s capabilities in the world’s largest market for fractional electric motors. It also brings major product line expansion, which complements our current product portfolio for North America”, Tiefensee explains. About WEG – Founded in 1961, WEG operates mainly in the sector of capital goods and is one of the largest world manufacturers of electric-electronic equipment, having five main businesses: Motors, Energy, Transmission and Distribution, Automation and Coatings. WEG has manufacturing units in 11 countries and is present in more than 100 countries, servicing all industrial segments, including oil and gas, mining, infrastructure, steel, pulp and paper, renewable energy, among many others. With over 31 thousand employees, WEG”s Net Revenues reached R$ 9.8 billion in 2015. Bluffton, IN October 28, 2014– Bluffton Motor Works will launch its new AmeriBlue line of Pool Motors at the International Pool Spa Patio Expo in Orlando, FL November 5th-7th. Durably constructed using the highest quality components, these motors are Made in the USA. Designed as a direct motor replacement for all of the leading pool pumps in the industry, the AmeriBlue motor will provide an instant quality upgrade over the standard product offerings being used in the market today. AmeriBlue offers a wide range of motor ratings in standard NEMA C-Face and Square Flange mounting options. Power ratings begin at ½hp and continue through 3hp, with models available in both standard and high efficiency designs. Several custom features that make these motors unique have been incorporated into the product design. These features ensure durability and increased longevity for the swimming pool environment. EY announces Bluffton Motor Works, President & CEO David Nussear is an EY Entrepreneur Of The Year™ 2014 Award finalist in the Midwest! Bluffton, Indiana, May 12, 2014 – EY today announced that David Nussear, President and CEO of Bluffton Motor Works, is a finalist for the EY Entrepreneur Of The Year™ 2014 Award in the Midwest. The awards program recognizes entrepreneurs who demonstrate excellence and extraordinary success in such areas as innovation, financial performance and personal commitment to their businesses and communities. Mr Nussear was selected as a finalist from nearly 80 nominations by a panel of independent judges. Award winners will be announced at a special gala event on June 18 at Navy Pier in Chicago. Founded in 1946, RAE Corporation has been providing high quality motion control products to a wide variety of industries throughout the United States. 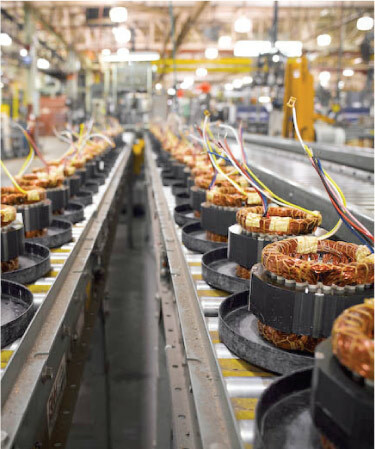 RAE’s ability to offer custom design solutions to the toughest applications is what sets them apart from most other DC motor manufacturers. We expect the acquisition of RAE Corporation to greatly strengthen our position in the fractional brushed DC motor market by providing custom design capabilities, as well as a line of stock motor products and controls.